Waycott, Michelle, Collier, Catherine, McMahon, Kathryn, Ralph, Peter, McKenzie, Len, Udy, James, and Grech, Alana (2007) Vulnerability of seagrasses in the Great Barrier Reef to climate change. In: Johnson, Johanna E., and Marshall, Paul A., (eds.) 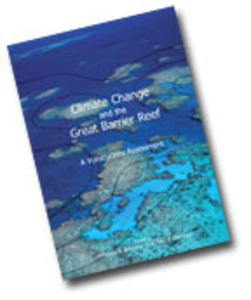 Climate Change and the Great Barrier Reef: a vulnerability assessment. Great Barrier Reef Marine Park Authority and Australian Greenhouse Office, Townsville, QLD, Australia, pp. 193-236. Seagrasses are flowering plants and, along with mangroves, have greater affinities to terrestrial plants than other marine macrophytes such as algae. Approximately 55 species of seagrass occur in five different plant families and represent at least three independent evolutionary lineages. Thus, seagrasses are not a taxonomically unified group but a ‘biological’ or ‘ecological’ group. The evolutionary adaptations required for survival in the marine environment have led to convergence in morphology. Seagrasses evolved under differing ambient CO2 and temperature conditions (Figure 8.1) so may have different tolerances to changing environmental conditions. A wide range of tolerances across marine environments exist amongst the extant diversity of seagrasses, reflecting their substantial adaptive capacity as a group. Seagrass diversity in Australia is amongst the highest in the world, in part due to the overlap of already diverse tropical and temperate floras. The bays, estuaries, lagoons and reef platforms of the Great Barrier Reef (GBR) region provide habitat for 12 seagrasses including one endemic species, Halophila tricostata. The seagrasses of this region are typically found growing in waters less than ten metres below mean sea level. However, some species of the genus Halophila can be found to depths of 56 metres. Shallow and intertidal seagrass meadows are influenced by coastal topography and shelter, as a result, most larger seagrass meadows are found in north facing bays and estuaries that are protected from the dominant south-easterly winds. The highest densities of seagrass occur between Princess Charlotte Bay and Cairns (13.5 to 17 °S) and below Rockhampton (23 °S). Seagrass meadows are sparse north of Princess Charlotte Bay and south of Mackay in the area where tidal velocities are high. The total area of seagrass habitat along the Queensland coast has remained relatively stable during the past 5 to 10 years. This publication does not have an abstract. The first two paragraphs of the Introduction are displayed as the abstract.